Freeware based on the technologies of MediaMan. A standalone utility program that does what its title says. It's extracted from the Amazon Import feature in MediaMan 3.0 build 1026. This program doesn't perform web-based information look-up. 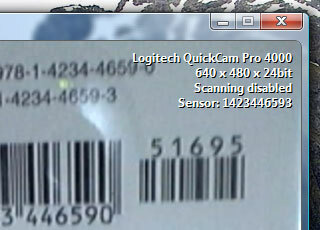 It only reads images from the webcam and attempts to identify barcodes from them continuously. When a barcode is found, it'll automatically copy this barcode to the clipboard. Right click on the webcam area to select a webcam if you have multiple ones.